Tackle your credit challenges and kick off a savings game plan with Dupaco's Credit Coach program. Credit is needed for a lot of things in life—from loans, to renting a place to live, to obtaining a job. Yet, many people face the question of "How do I get my credit approved for these things if I don't have credit in the first place?" With Dupaco’s Credit Coach program, those who either have no credit established, or have damaged credit to repair can benefit by getting in the habit of making loan payments, which boosts the largest segment that makes up your credit score: Payment history. The money borrowed is secured in your savings account for the term of the loan. You’ll earn interest dividends while you make payments and establish credit at the same time. You can set an affordable payment plan that fits in your budget and you’ll receive personal financial coaching from a Dupaco loan expert. How does the Credit Coach Program work? A Dupaco loan expert will coach you on how to drive up your credit score and get back on the road to financial success. And for those with no credit history, we can create a road map for establishing good credit. Then, your personal savings goals and affordable payment plans are discussed to start your Credit Coach Loan. The Credit Coach Loan is a short-term, share-secured loan that has different approval guidelines from a traditional loan, so nearly everyone qualifies. The money you borrow is secured in your savings account for the term of the loan. Interest dividends are paid on this money while you make payments and establish your credit. You will be unable to access these funds until the balance of the loan has been paid in full. At the end of your loan term, you will have the money you have paid available in your savings account to use or you can continue to save for a rainy day. 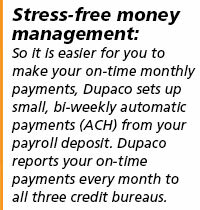 Throughout the term of your loan, you benefit from one-on-one access to a Dupaco personal coach that includes free credit report reviews and financial education on the lending process and building savings systematically. In addition, you can utilize Dupaco's free credit monitoring service, Bright Track, to help you keep an eye on your credit score and credit report during, and after, the Credit Coach Program. Bright Track is accessible via Shine Online Banking. Kick off your savings game plan today and schedule an appointment with a Dupaco lender by calling 800-373-7600 / (563) 557-7600, extension 202, or by requesting an appointment below! Hello- I'm interested in a low-interest loan to consolidate my credit card debt. Hi Tanya, we'll have a member service representative reach out to you.